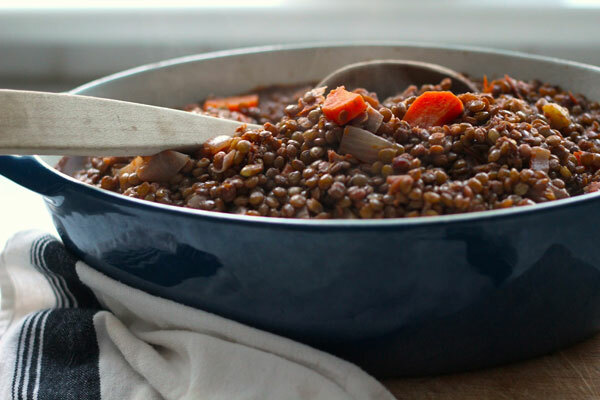 This hearty, warming and deeply flavorful lentil stew is a great way to use up frozen tomatoes, or blemished overripe ones that have been sitting on your counter too long. And since it’s clean-out-the-freezer time of year, I’ve been scrambling to use up a whole assortment of random things from the freezer lately to make space for the bounty that this new growing season is about to bring. There’s oh, only about a gazillion jars of pestos (garlic scape, basil, cilantro pesto, you name it we have it), bags of salsa verde, tubs of rhubarb sauce… But the most space-consuming of all are the giant ziplock bags filled with tomatoes that we hurriedly shoved in there last fall. It always happens that the fall tomato crop peaks at the busiest time of year, when everything is screaming to be harvested all at once. At a canning workshop I took a couple years ago, the instructor suggested throwing whole tomatoes into ziplock bags and simply freezing them in the fall, and then on quieter winter days when the wood stove is chugging away, that’s when you boil down your tomatoes for canning. Brilliant! If you have a wood stove, it’s an energy-wise way to process your tomatoes because it can take hours to boil down tomato sauce. So a couple weeks ago, I finally canned our tomato sauce, in peace and quiet, fueled by the heat of the wood stove. 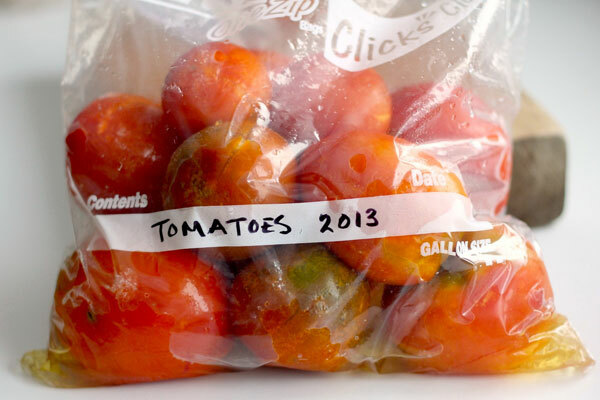 But there were so many bags of tomatoes in the freezer, I wanted to find other creative uses for them too. 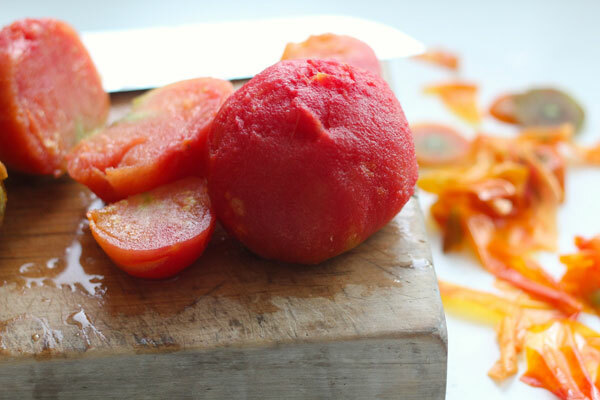 The great thing about using up whole frozen tomatoes is that as they thaw out, their skins will peel right off. 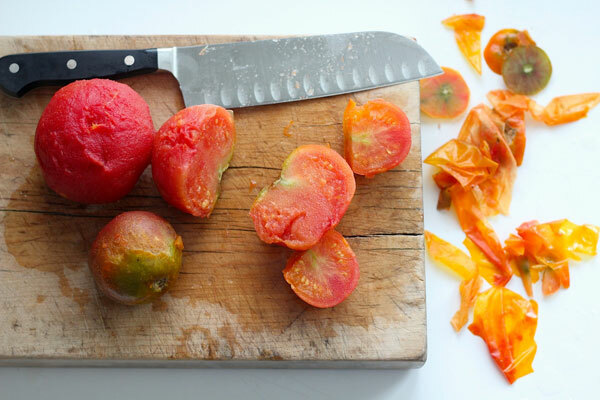 So you’re quickly left with whole peeled tomatoes to simply chop up and throw into the pot. And if you don’t have a pile of tomatoes in your freezer like I do, a can of chopped tomatoes will do just fine. However, if you can find an alternative to tomatoes in tin cans, I recommend it because the acidity in tomatoes has been shown to leach BPA from the lining of cans. Some companies now sell chopped tomatoes in glass jars. A note about lentils. 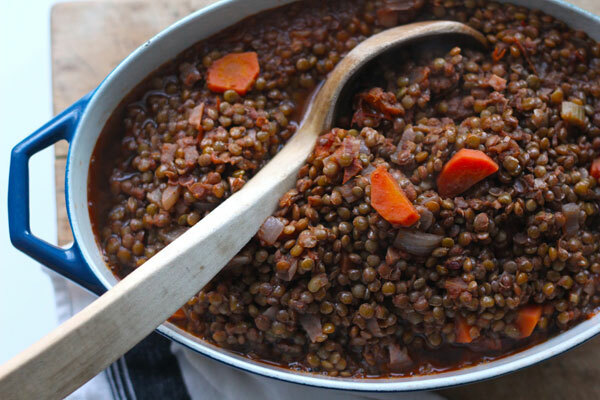 I prefer to use French Puy lentils in this recipe. They are a darker shade of green than the standard green lentils and the reason I prefer them is that they hold their shape better in a stew. You can buy them at most health food stores. However, you can certainly use the standard green lentils for this recipe if you can’t find Puy lentils. I don’t recommend using canned lentils for this recipe, dry lentils will have a better taste and texture. (Also they tend to be cheaper when you buy them dry). Unlike beans, dry lentils do not need to be pre-soaked. They simply need a little rinse under running water and they’re ready to cook! 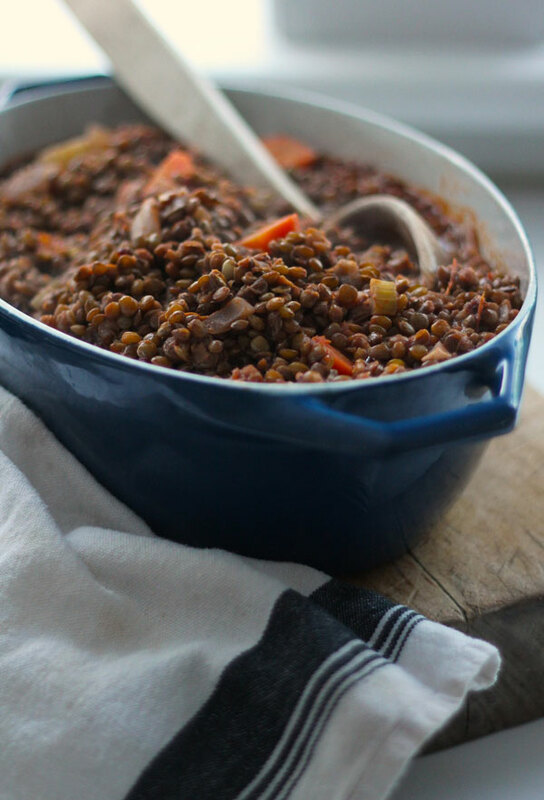 From Aube Giroux of the Kitchen Vignettes blog: This hearty lentil stew is a great use of tomatoes for a flavorful meal. In a large heavy-bottomed pot or Dutch oven, place the olive oil and chopped onions, cooking on medium heat until the onions have softened. Add the bacon to the onions and cook a few more moments, until the bacon starts to sizzle. Add the celery and garlic and cook for another 4 to 5 minutes until everything is just starting to get golden and fragrant. Rinse the lentils, drain, and add them into the pot along with all the remaining ingredients including: chopped carrot, red wine, chicken stock, dijon mustard, sugar, tomatoes, and parsley. However, leave the salt out until the stew is fully cooked because to obtain nice tender lentils, salt should always be added at the end of cooking, otherwise they can toughen and harden the lentils as they cook. Cook your stew on medium-low heat, covered, for about 45 minutes to an hour, stirring occasionally. Once the lentils and carrots are soft and the flavors in the stew are coming together, add the salt. Start with 1 teaspoon of salt, stir it in, and taste. I find that salting lentils generously brings out their full depth of flavor so don't be afraid to add more salt, just be sure to do it in small increments. If the stew is too thick, you can add a little water too. After salting and adjusting the liquid levels to your taste, cook for another 5 minutes and then serve warm, with slices of crusty bread and a little grated parmesan on top.